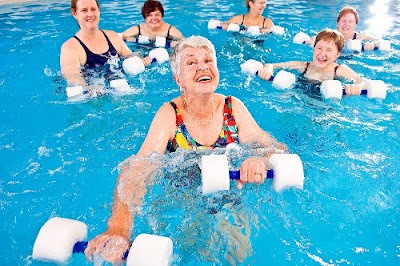 Since January is always the month to start a new exercise routine I thought I would start with aqua aerobics. I loved my aqua aerobics class at the YMCA during my pregnancy with Blake and made many, great connections with people whom I still talk to. Yesterday was my first day in the class and boy did I not realize how long it has been since I have truly exercised (huffing and puffing next to my mother on a treadmill days before I found out I was pregnant). It will take a while to get back into the rhythm of things, but I am sure my birth story will be better because of it. So go one people, start your 2010 exercise plans. At least you can say you tried even if you stop doing it a month down the road.